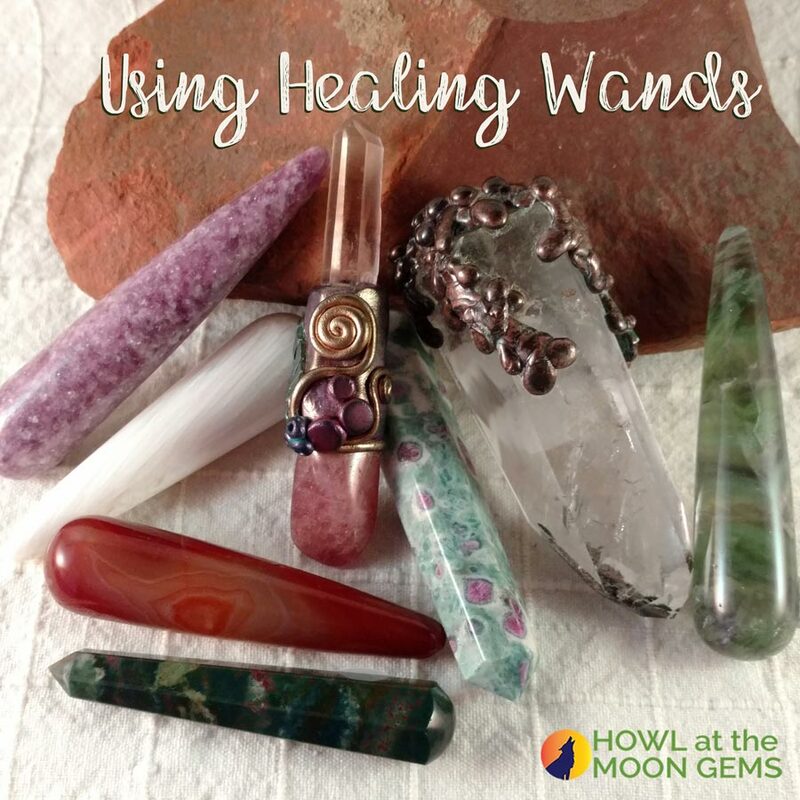 Using some sort of wand during healing sessions has been a common practice through the ages. A wand of any sort allows us to focus energy to a very specific point. In our personal healing practices, using a gem that carries the qualities of helping what we are trying to correct, is a benefit greatly improving our efforts. And when in doubt, Quartz is ALWAYS a good starting point. It is an aid at any Chakra or energy point in the body. They don't need to be big fancy things! For myself, I find I most often will use one of my two inch natural points. In my case, it has more to do with the energy of a healing crystal than it does its look. I am fortunate in that many times I will hear this little voice say - hey! use me! But don't get me wrong, I do have some fancy combos, well, because they talked to me ;) Best advise? Go with what your hand or eyes seem drawn to. Most times our little earthly assistants will figure out a way to let us know. Just like debating healing properties of our crystal friends, there is lots of debate on correct crystal wands for specific purposes. Trust your own intuition on it. If it feels right, if it achieves the effect, then you made the right choice. Regardless of what an expert or book may have said! Most times we have no idea of all the energies that have come to play in a gem or crystals formation. You will just find that even though it seemed an odd choice, it had a little extra sumthin' sumthin' to get the job done. And sometimes our 'logical' thinking isn't totally right, it's not totally wrong either, but maybe we are only seeing the top layer of an issue and not what lays at the root of it. The shape itself DOES make a difference as far as energy focus qualities. Crystals grow from their base up. Energy flows up to their tips. It is how they naturally are, so, we really want to use them that way. It is how any energy put through them will smoothly flow. And when I say energy we put through them, that IS what is happening. What is important is that we don't use OUR energy, we draw upon the universal healing energies available to us. Do we gain benefit from the gems own energy and healing qualities? Absolutely! It becomes intensified, as it gets a boost from Source. For those new to energy work, here is a simple practice in using Source-The Divine-Spirit rather than your own energy. Place the crystal, wand, etc. with the base in the center of your palm. Close your eyes and draw in universal healing energies through the top of your head (Crown Chakra). Feel it enter and flow down your arm to your hand and then out of the end of the crystal or wand. Become the 'conduit' the energy flows through to get to where it's needed. At the end of healing sessions you will feel refreshed rather than drained from using your own energies, and effects are usually more pronounced. So, I have talked about bringing IN energy for healing. What if you feel very strongly there is something that needs to be removed? You don't want to reverse the crystal in your hand, that would most likely shoot stuff back into you. Ack! Not a good thing. BUT, you can hold its base on the trouble spot, place your other hand on the person drawing healing energy into them and shoot it through them and then the wand and out and away. You can also use a crystal tip to sort of stir up an energy block using a counter clockwise motion and gently pull it out. As you do this you will want to periodically 'shake off' what you are removing towards the ground (where it gets reabsorbed and grounded). Either way works well and you are not taking in what needs to go. I would encourage experimenting with both options to see which has a better fit for you personally. I hoped I have answered questions you may have had and find this information useful on your healing path. As always, if you have questions, drop me line. You can check out my healing wands below.